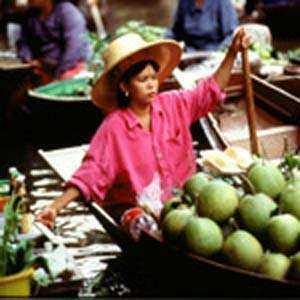 Welcome to Bangkok, nicknamed “Venice of the East!” Hotel rooms are available for mid-afternoon check-in. Today’s PRIVATE GUIDED TOUR starts with a BOAT RIDE through the klongs, Bangkok’s canals. Next, stop at Wat Arun, the TEMPLE OF THE DAWN, whose 260-foot-tall spire has become identified with Bangkok. Continue on to the GRAND PALACE, comprised of the Funeral Palace, the Reception Palace, the Throne Hall, the Coronation Hall, the Royal Guest House, and the TEMPLE OF THE EMERALD BUDDHA. Also visit the TEMPLE OF THE RECLINING BUDDHA, the oldest and largest Buddhist temple in Bangkok. It houses more than 1,000 Buddha images, including the 49-foot-high and 151-foot-long massive Reclining Buddha. 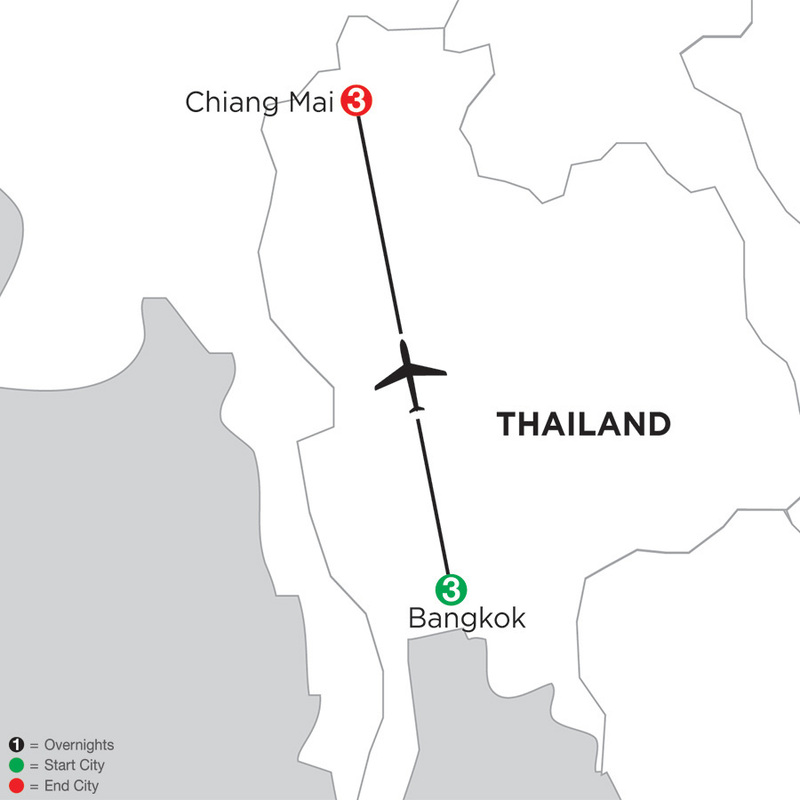 Today, fly to Chiang Mai, Thailand’s second-largest city. Today, your PRIVATE GUIDED TOUR begins with a visit to WAT PHRA SINGH with its famous Buddha image, and WAT DOI SUTHEP, a temple tucked away in the mountains. For the final ascent to the temple, you can take a tram car or walk up the Naga (dragon-headed serpent) staircase, with more than 300 steps. On a clear day, you will enjoy spectacular views of Chiang Mai. The remainder of the day is at your leisure. Today, take a PRIVATE GUIDED EXCURSION outside the city to BAAN TONG LUANG to visit several hill tribe groups, including the AKHA, known for gorgeous headdresses decorated with silver coins; and the KAREN, home to the PADAUNG LONG-NECKED WOMEN. Early in life, brass rings are placed on the necks of the village girls and as they mature, additional rings are added. This pushes the collarbone down and compresses the rib cage, creating the illusion of stretching their necks. The remainder of the day is at your leisure. Holiday Inn Express Bangkok Sathorn is a comfortable and modern hotel just steps from many dining and entertainment choices on Silom Road. The hotel is situated nearby a SkyTrain stop, offering access to the city's center and major attractions such as The Grand Palace, Temple of the Emerald Buddha,and Erawan Shrine. Located in the middle of Bangkok's Sathorn business district and Silom entertainment hub with easy access to the city center. Rooms are modernly decorated with unique artwork painting various scenes of life in Bangkok and offer free WI-FI and cable TV. Nestled in the heart of beautiful historic city of Chiang Mai, in a lush greenery park, The Empress Hotel & Convention Centre offers magnificent location of 20 minutes drive from Chiang Mai International Airport & Railway station. The city's famous handicraft center Night Bazaar with the night entertainments and commercial zone are just 10 minutes walk away. In the heart of Chiang Mai's commercial area and only a 10 minute walk to the Night Bazaar. Accommodation with an imaginative design echo the charm of Northern Thai cultures plus wide ranges of modern room amenities & facilities at your fingertips. Set in the historic district of Bangkrak, known for its diverse local street food and exciting nightlife, this property affords easy access to enjoy the capital city. Savor the urban views from the rooftop pool or keep fit at the well-equipped gym. This hotel is part of the historic Bangkrak district, and a 15 minute drive from the airport and Chinatown. All rooms are decorated with original Thai art prints and feature WI-FI, flat-screen TV, and rainfall showerheads. Situated on the banks of the Chao Phraya River, this luxury hotel boasts gorgeous views of the natural side of Bangkok. A BTS station is adjacent, allowing easy access to the city's main sites like the Grand Palace and Wat Phra Kaew. This property is located along the river and adjacent to public transportation. Each room offers a river or city view and is designed with Thai-inspired décor with contemporary accents. Amenities include premium Shangri-La toiletries, rainshower, free WI-FI, and flatscreen TV. This boutique resort has a great location close to the city center and captures the essence of the Lanna people with subtle architectural details and inspiring interior decor. Nestled along the banks of the Mae Ping River and in the center of Chiang Mai, only minutes away from the city's popular Night Bazaar. Spacious contemporary guestrooms feature private balconies, widescreen plasma televisions, home theatre, Wi-Fi access, and bathrooms with built in LCD TVs and rain shower. This luxurious hotel offers tranquility amid a busting city center. Rejuvenate at the outdoor pool and take in the stunning mountain views after a day of sightseeing. The hotel is conveniently located in the heart of this culturally rich city, just a 10 minute walk to the Chiang Mai Night Bazaar. Rooms reflect contemporary Northern Thai design and decor with an emphasis on comfort. Amenities include premium Shangri-La toiletries, rainshower, and free WI-FI. 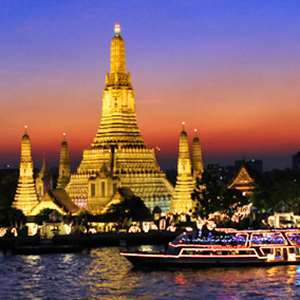 We'll show you a unique, from-the-river perspective of Bangkok's captivating beauty on this unforgettable dinner cruise. Embark your water craft and relax as you float peacefully along the Chao Phraya River past the city's most popular attractions. We combine history, culture, cuisine, and beautiful river scenery on this romantic cruise down the Chao Phraya River aboard a converted rice barge. 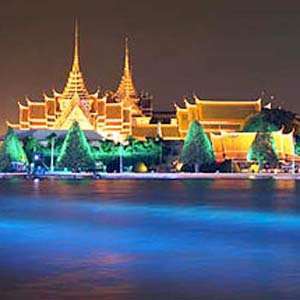 Immerse yourself in the wonder of Siam Niramit (the Enchanted Kingdom), one of the largest stage productions on the planet. Imagine a grocery-shopping trip where you have to flag down the merchants as they float by on boats. No, it's not a Wonderland-style flight of fancy, but a traditional way of buying and selling colorful fruits, vegetables, meats, flowers, and sweets since the 19th century. Later, visit Nakhon Pathom to see Phra Pathom Chedi, one of the tallest Buddhist stupas in the world. Stop for lunch at the picturesque Sampran Riverside Resort, and visit Patom Organic Village. If you love art, antiques, and fantastic architecture - as well as a good mystery - then our excursion to the Jim Thompson House & Museum is a must. On this poignant tour, we'll introduce you to fascinating but seldom-taught parts of World War II history. A highlight of this excursion is a long-tail boat trip to view the infamous bridge up close spanning the River Kwai and the "Death Railway", somber reminders of the thousands of POWs and forced Asian laborers who lost their lives during the railroad's construction. 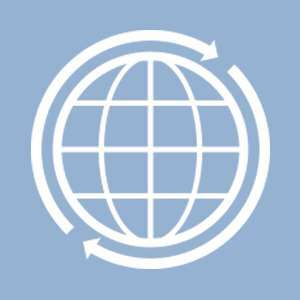 Monograms provides travelers access to a Local Host®, so you will have someone on hand to answer those vacation questions pertaining to Bangkok. No waiting in line at the concierge desk or trying to ask your waitress at breakfast directions to the shopping district. Simply ask your Local Host about Bangkok and you'll be on your way in no time. Plus, your Local Host will share local Bangkok insights and share suggestions for getting off the beaten path, leaving you more time to create lasting vacation memories that are yours alone. I'm Kong. Since 1988, I have worked as a guide and in 2006 I was voted Best Tour Guide (English speaking) at the Thailand Tourism Awards. I love to teach others about Thai culture and how to speak some key words and phrases in Thai. I am approachable and energetic and interactions with my guests are one of the favorite parts of what I do. I look forward to sharing my knowledge of Bangkok with you. You may decide you can’t get enough of the delicious local flavors, and if that’s the case, spend half a day at The Blue Elephant to learn how to prepare authentic Thai at home. This cooking school takes you through the entire process—from shopping at a market to enjoying your dishes. While it’s somewhat more expensive than a half day of museums and lunch, the long-term benefits are immense. Lumpini Park is an inner-city haven of peace, fresh air and greenery – inviting visitors to connect with nature or enjoy outdoor leisure activities. Named after the birthplace of the Lord Buddha in Nepal, the park is a shady oasis home to various flora and fauna including the eccentric water monitor lizard. Grease the elbows and stretch the knees; it’s time for a hectic shopping experience. There’s something for everyone here—from the bargain-hunter to the clinically fashionable. Clothing, jewelry, crafts, and much more are on full display in this busy area. Make sure you venture behind the street-front vendors to Pratunam Market for international goods. Keep in mind, bargaining here is more about being friendly and respectful. With an old school feel, the Apoteka Lux Bar is based on an outdated word for pharmacist and emulates a 19th century apothecary. Come for the live music or grab a spot at the patio for a nice place to curl up for a romantic night or meet some friends. Bangkok is blessed with several “Sky High” options where you can have dinner and/or drinks with a stunning view over the city. Check out the Octave Rooftop Lounge & Bar on the 45th floor of the Marriot Hotel Sukhumvit for a great sunset or romantic meal with the only 360 degree view of Bangkok. Be prepared to pay a little more but it’s worth it! There are countless places offering traditional Thai massage in Bangkok. One of the best choices is the Thai Massage School at Wat Pho. Many of the local masseuse and masseurs were taught here, and you can get a 1-hour massage for $15 to $20 USD. You can also learn the techniques for yourself! These small 3-wheeled vehicles are an interesting way to get around and should be tried by anyone traveling to Bangkok. Make sure to negotiate the fare before sitting down. Monograms provides travelers access to a Local Host®, so you will have someone on hand to answer those vacation questions pertaining to Chaing Mai. No waiting in line at the concierge desk or trying to ask your waitress at breakfast directions to the shopping district. Simply ask your Local Host about Chaing Mai and you'll be on your way in no time. Plus, your Local Host will share local Chaing Mai insights and share suggestions for getting off the beaten path, leaving you more time to create lasting vacation memories that are yours alone. My name is Kim and Chiang Mai is my home town. I was born and grew up here. I'll never move to another city because I love my culture and my city, and I'm excited to share it with other people from around the world. Spanning several blocks, this large market features food and Thai goods at great prices. Local handicrafts like carvings, jewelry, silk, and hand-woven fabrics are an especially good value here, because they are made in such close proximity. The other big draw is the street food, which is some of the best in the world. So make sure you have room in your stomach. Give yourself a couple of hours to explore fully. The mountains surrounding the city are the best thing about Chiang Mai. You can hire a guide to help you explore them or go on your own if you are experienced. Either way, exploring the jungle on foot or on a bike is a rewarding experience. Drive along the winding road to Doi Inthanon, the highest peak in Thailand. The Park is known for its incredible views, including Watchiratharn waterfall and the twin Chedis. Late January through February, you may be lucky enough to catch the beautiful, pink, Siamese sakura flowers in full bloom. Baan Tawai Village is known for Thai handicrafts and handmade items that reflect the history and local way of life. Find brilliant wood carvings as a great souvenir of your travels.